The 2A clone from the Ferrington Vineyard provided red fruit notes and suppleness while the Klindt and Wiley Vineyards provided dark fruit flavors. The old‐block Pommard from the Conzelman Vineyard contributed herb, cherry and spice notes with acidity and tannins for structure. The nose is bright with cherry notes. The complex flavors of red licorice, cherry and cranberry are held together with firm acidity, and lead to a long and satisfying finish. Ready to drink now, and with proper cellaring will age gracefully over the next 5‐10 years. 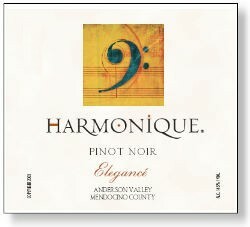 This is a true Anderson Valley Pinot with multiple clones of fruit from both the warmer area near Boonville, and the cooler “deep end” of the valley closer to the cooling ocean breezes. Fruit from Conzelman, Ferrington, Klindt, and Wiley fruit was included.